VillageTownCrier founder, Osayimwen Osahon George is predicting the nationwide industrial strike action as scheduled for Wednesday, the 18th of May, 2016 by the Nigeria Labour Congress in protest against the removal of the fuel subsidy by the Federal Government may end up being a mere holiday for workers across Nigeria. It should be noted that there is currently a 60% increment in fuel price specifically from N86.50 to a whooping sum of N145 per litre. Former president Goodluck Ebele Jonathan's attempt to remove the fuel subsidy on the 1st of January, 2012 failed due to lack of public support and trust. Nigerians invariably presumed the public officials would be having larger funds to loot. Buhari's anti-corruption fight which has gained recognition in the international community and led to the recovery of a sum of N600 billion coupled with the arrests of notable Nigerians who served in the previous administration by one of the country's anti-graft agencies, Economic and Financial Crimes Commission, EFCC. These have increased the faith of Nigerians in government which is deemed to reflect positively on the removal of fuel subsidy. The aim of subsidy anywhere in the world is to cater for the interests of the common people. The issue of fuel subsidy in Nigeria has created a safe haven for 'legal corruption' in by powerful figures known as the 'Oil Cabal'. In the year 2011, a sum of N245 billion was budgeted for payment of fuel subsidy by the Goodluck Ebele Jonathan administration which at the end of the year gulped a payment of N2.6 trillion. This high-level robbery has gone unanswered till date in a 55-year old country that claims to have a working constitution and judiciary. According to the startling details of the highly classified letter leakage between Minister of Transport, Rotimi Chibuike Amaechi and the Emir of Kano, Muhammadu Sanusi II, a huge amount of crude oil worth $7 billion was stolen yearly by organized 'oil rats' as exposed by a delegation from the United States of America government. Authoritative reports from the Minister of State for Petroleum, Ibe Kachikwu also have it that some unscrupulous oil marketers have been illegally diverting 30% of fuel to neighbouring countries including Cameroon and Chad after securing subsidy from government for the purpose of selling at cut-throat prices. 400 trucks of Nigerian National Petroleum Corporation, NNPC were reportedly sent to Lagos but investigations revealed that only 250 trucks were delivered while 150 trucks were diverted for obnoxious interests. Unconfirmed reports also have it that oil marketers have been selling the dollars obtained from the Central Bank of Nigeria under the guise of fuel importation at the black market for the purpose of making indiscriminate profits without importing fuel. The dollars are obtained the official rate of N197 from the apex bank and sold at parallel market at the rate of N320 or above. In summary, Nigerians desire to have the loopholes of fraud in the oil sector finally plugged by the removal of the fuel subsidy and the liberalization of the oil market. Nigeria operates a monocultural economy that relies heavily on the exportation of crude oil in the generation of 95% of the country's foreign exchange earnings. Following the fall in oil prices in the international market, the country has witnessed an over 60% sharp drop in foreign earnings. The oil earnings of Nigeria sits at a depleted value of $550 billion in a month since April, 2016 and the government expends a sum of $225 billion in the importation of fuel. There is the wild scare of a negative economic effect on the already depleted Federation Account from which funds are distributed among the federal, state and local governments if the government attempts to increase its 50% quota in the importation of fuel for equitable distribution in the country. With funds generated from the deregulation of the downstream oil sector, the current four refineries in Warri, Port Harcourt and Kaduna can be maintained to full capacity and new ones could be built as promised by government coupled with the emergence of private refineries which will encourage healthy competition in the oil sector towards efficiency. The prowess of social media in Nigeria has sensitized the general public on the major agenda behind the removal which will affect the public support of the strike action and subsequent protests. In the last two months of the biting crisis of fuel scarcity, Nigerians have bought fuel for hyper-inflated prices ranging from N200 per litre upwards. The cheapest price currently at the black market is N150 per litre which a highly competitive demand. This has also had a direct effect on the prices of goods and services. Unconsciously, Nigerians have gotten accustomed to the emergency prices and are only interested in the availability of fuel especially the business owners who need to stay in operation against all odds. The phobia of Nigerians for the endless queues at petrol stations led to the growth of the black market that became highly lucrative. This will affect the objectives of the NLC and TUC as they mayn't get the required 100% dedication from the general public as enjoyed in the famous 2012 protest for the same cause. A strong example is the news that the National Association of Aircraft Pilots and Engineers (NAAPE) have backed out of the scheduled strike due to its support for the Federal Government on the removal of fuel subsidy. The last struggle between the Federal Government and opposing bodies like the Nigeria Labour Congress, civil societies (Occupy Nigeria), Trade Union Congress on the fuel subsidy in 2012 during the Goodluck Ebele Jonathan administration left a couple of questions unanswered. The people who spent days at the MKO Abiola garden in Lagos state including other bodies at several locations in Nigeria felt betrayed by the labour union's inability to push for an outright reversal of the fuel price from N141 to the initial N65 as agreed. The consensus reached with the Federal Government left the price at N97 per litre which yielded issues of distrust in the system. Some concerned Nigerians are currently trending short articles on social media to sensitize Nigerians against the proposed strike action of the NLC and TUC. 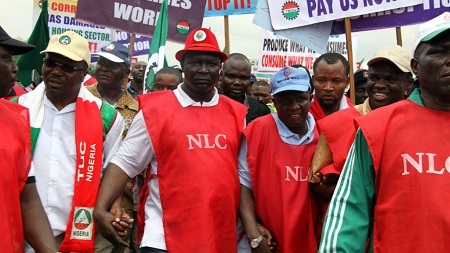 Nigerians are suggesting that the leadership of the NLC through its Cooperative Societies should venture into fuel importation since it’s an open market and sell to its members at lower rates just as it has been selling lands, cars, electronics etc through the same body at various government institutions. In conclusion, I strongly believe Nigerians are ready to face their worst fears concerning the removal of the fuel subsidy. This is the only way to halt the protracted debates renting the media space for years now. These are hard times that warrant hard decisions before Nigeria becomes Greece.